UC Davis Health System research presented today at the annual meeting of the Radiological Society of North America in Chicago helps resolve two persistent questions about knuckle cracking: What causes the "crack" sound, and does it damage the hand? In the first study of its kind, 400 ultrasound evaluations showed that the knuckle-cracking sound occurs when gas bubbles form in joints very quickly—faster than the blink of an eye. 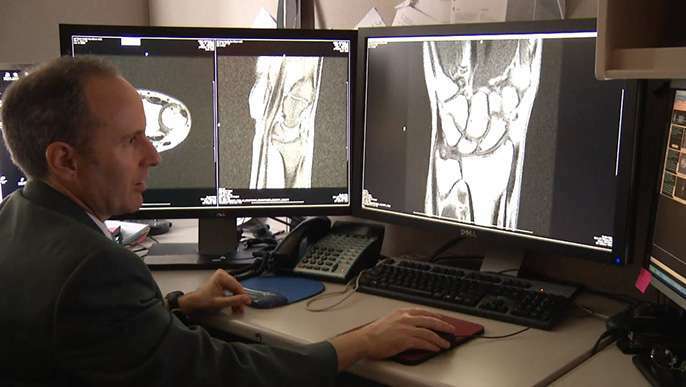 "Ultrasound allows us to diagnose various causes of 'clicks' and 'clunks' around joints," said study lead Robert Boutin, a UC Davis professor of radiology and specialist in musculoskeletal imaging. "But knuckle cracking looks entirely different—like fireworks exploding on the 4th of July." Despite the fireworks, physical examinations by hand-injury specialists found no problems in the joints of knuckle crackers. This finding contradicts a previous study that suggested that knuckle cracking can cause joint swelling and weaken the grip. Boutin and his colleagues studied 40 men and women between the ages of 18 and 63 years, three-fourths of whom were frequent knuckle crackers. Under ultrasound, participants tried to crack their knuckles by pulling or pushing the joints at the base of their fingers. "When a joint did not crack, it just looked like the bones were being pulled apart a bit," said Boutin. "But when a joint did crack, the ultrasound almost always showed an extremely distinctive, brilliant flash appearing in the joint." So why do more than 1 in 4 adults say they crack their joints? "After a joint cracked, it had a significantly increased range of motion compared to the other joints that did not crack," said Boutin. As for which comes first—the cracking sound or the brilliant flash—Boutin said the researchers consistently heard the "crack" before they saw the "flash." This finding supports those who have argued that the crack is caused by energy released by a bubble forming, rather than a bubble bursting like a balloon. "A larger study will help determine if there are longer-term hazards or benefits of joint cracking, but we're excited we have found a way to answer some longstanding questions about the safety of this common habit," Boutin said.